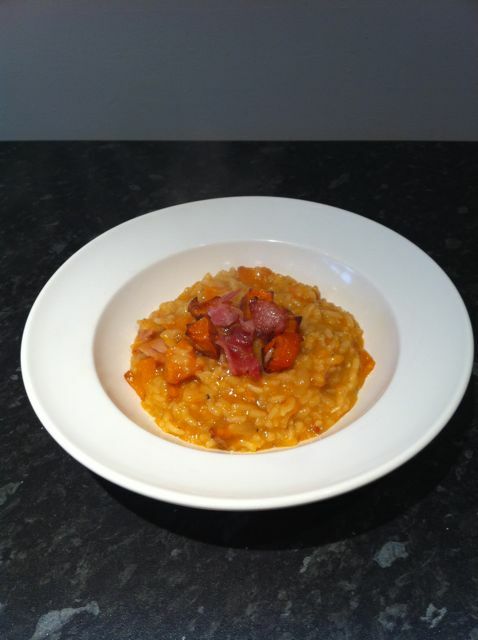 This was a momentous occasion – my very first risotto! I made my Super Duper Butternut Squash and Goats Cheese Lasagna at the weekend and having bought a huge beast of a butternut squash, I was left with roughly half of it and no real desire to eat any more after overdosing on the lasagna ever so slightly. 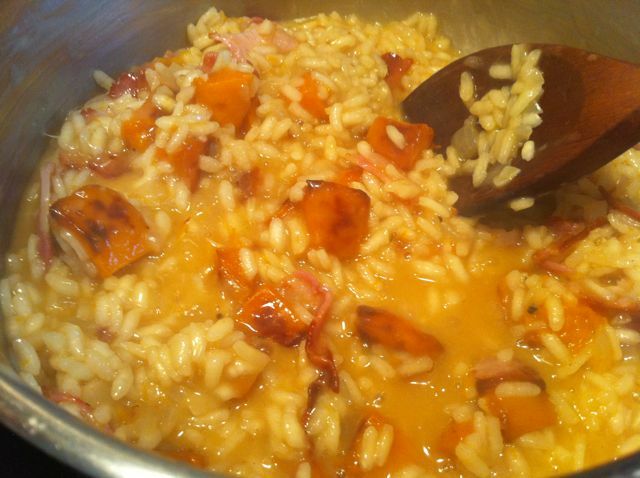 After Googling recipes that combined both leftover butternut squash and leftover bacon, the recipe that kept popping out at me was RISOTTO! 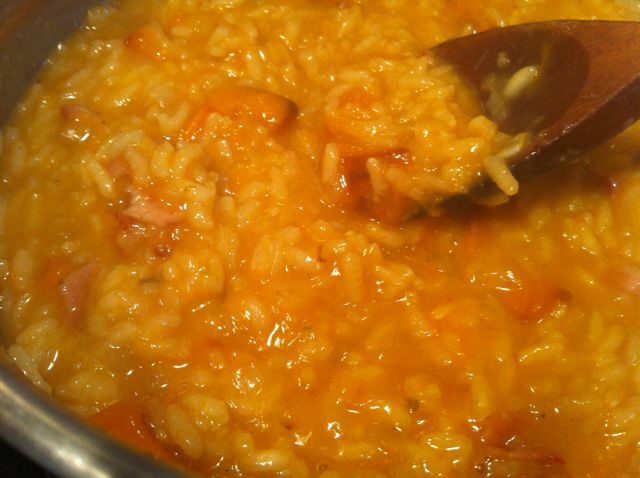 I absolutely love risotto and often order it in restaurants. However, I’d never entertained the notion of cooking it myself as I knew it was a notoriously hard dish to conqour and despite seeing it cooked many times on TV, quite frankly I was scared. But, we had all the ingredients and I had an entire evening to kill so risotto it was! 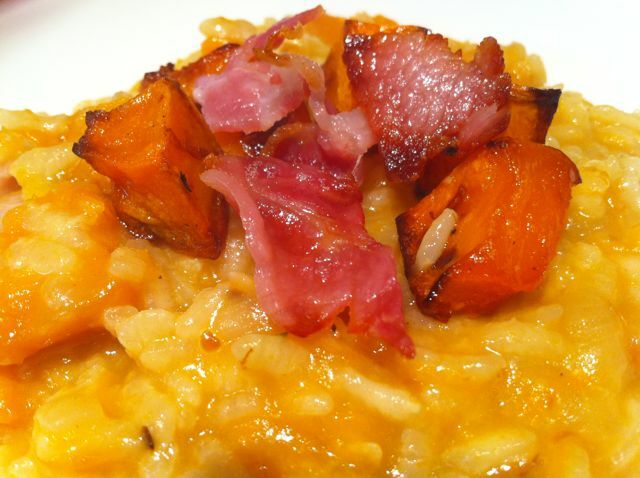 I started by roasting the cubed butternut squash with a drizzle of honey while I began the risotto itself. I watched a combination of Youtube videos and read multiple recipes online so my final product was a kind of mish-mash of everything I’d seen. Luckily, it worked! As I mentioned in a previous post I am On A Diet so made valiant attempts throughout the recipe to make it slightly lower-calorie and healthier. I failed immediately on the first hurdle when I realised you pretty much have to cook the onions in butter so you can then coat the rice in the oniony, buttery mixture to start the cooking process. So what started as a few feeble sprays of “1 Cal Spray!” turned into admitting defeat with two generous tablespoons of butter. Clover Light mind, but still butter. I stirred the rice around in the pan with my softened onions and butter until the rice started to go translucent on the edges. It was go time! I assembled my other ingredients and mentally prepared myself for a lottttt of stirring. I used chicken stock which gave it a lovely rich flavour which worked really well with the bacon and the sweetness of the squash. I made approximately a pint of stock – I wasn’t using the correct amount of rice as I didn’t quite have the amounts the recipes called for so I adjusted the stock amount accordingly. I also skipped the wine step as I didn’t have any wine to hand (for once in my life…) and I don’t think it affected the flavour at all. The next thirty minutes or so involved adding the stock to the pan in small amounts and stirring until it was absorbed, which I found incredibly theraputic! 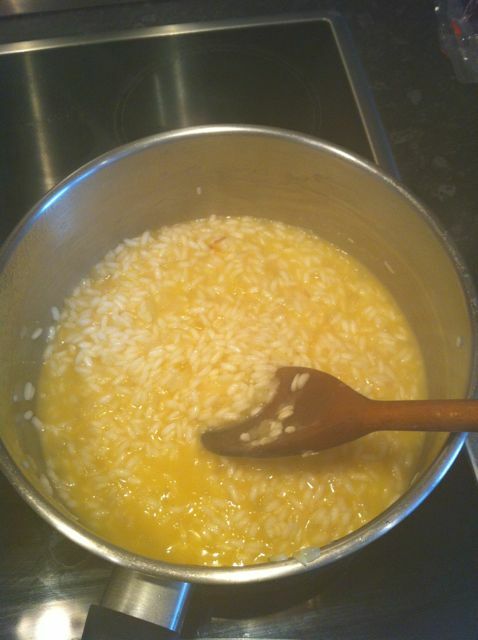 Here is the rice right at the beginning of the stirring stage, coated in butter and the softened onions. In between stirring I grilled 4 slices of back bacon (fat removed! I know, so boring…) and kept an eye on my roasting squash. Once the cubes were soft and golden brown with delicious sticky honeyed edges, I removed them. I then had a dilemma as I wasn’t sure if I was going to puree the squash and add it to the rice or just add the cubes in whole. In the end, laziness won out and I minimised the YouTube window showing Gordon Ramsey’s butternut squash risotto with pureed squash. Sorry Gord! I have to say this was a fabulous decision. The cubes softened slightly in the rice and broke up unevenly, leaving a mixture of almost indiscernible puree which acted as a thickener to the rice alongside larger, textured chunks. Lovely! After a while I noticed the rice grains had really swelled in size and nearly doubled the amount in the pan which is really quite exciting to see. The butternut squash had broken up into the rice and turned it a lovely peachy, Autumnal colour. I’m not sure how you know enough is enough when it comes to the stock adding, especially when you aren’t following a specific recipe and therefore have no idea how much stock you should have added in the first place. But, the final glug felt like the right time to stop, so I did! 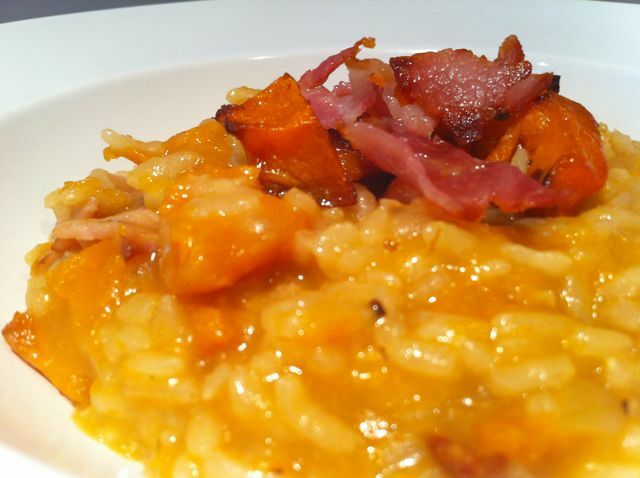 I served my pretty greedy portion of risotto very simply with a garnish of excess bacon and butternut to break up the vast expanse of rice. I think it looked beautiful! And more importantly, it tasted beautiful. I was initially worried that the combination of salty bacon and salty chicken stock would combine to create a crazy sodium-coma-inducing dish but I think the robust flavour of the butternut squash stood up to the salt and told it to pipe down. I was very very pleased with my first risotto and like everyone else who’s probably ever made one, am wondering why it’s taken me so long! This really is a simple dish and it’s good to know that you can mix and match recipes to create something more to your taste without sacrificing the final outcome. Next on the risotto bucket list – Four Cheese (how can that not be incredible!?) and something involving chicken. I am no longer afraid of risotto!